Iranian Foreign Minister Manounchehr Mottaki gave no details of the Iran's new counteroffer to the West. (CNN) -- Iran's foreign minister on Saturday issued an ultimatum to the West: Either renegotiate the United Nations-backed deal on Iran's nuclear program, or the Islamic republic will enrich nuclear fuel on its own. Foreign Minister Manounchehr Mottaki said the West has until the end of January to accept a counter deal proposed by Iran, though he didn't give details on Iran's offer, according to state media. 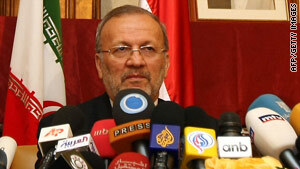 Otherwise, Iran will "officially declare" that it will produce enriched fuel at 20 percent, Mottaki said. Mottaki's comments came two days after Iran failed to meet a year-end deadline to accept a deal offered in October by the "P5 plus one" -- permanent United Nations Security Council members Britain, China, France, Russia and the United States, plus Germany. The six nations offered Iran a deal to send most of its low-enriched uranium abroad for conversion into fuel for a medical reactor in Tehran. The International Atomic Energy Agency (IAEA), the U.N. nuclear watchdog, has proposed that Iran send low-enriched uranium to Russia and then France for processing. Last month, Mottaki said the country was ready to give up some 400 kilograms of 3.5 percent enriched uranium in exchange for 20 percent enriched fuel that would power the reactor used in cancer research, according to state-run Islamic Republic of Iran Broadcasting. But Iran's counter deal appears inconsistent with the IAEA draft agreement, which asks for 1,200 kilograms of low-enriched uranium, a senior State Department official told CNN. According to Iran's state-run Press TV, the reactor will soon run out of fuel. And Iran has not accepted the IAEA proposal because it says it wants "concrete guarantees" that its fuel will be returned, said Foreign Ministry spokesman Ramin Mehman-Parast, that network reported. The controversial deal could reduce the amount of material Iran has to make a nuclear bomb, and the United States and some of its allies fear Iran's goal is to do just that. Tehran, however, has insisted its nuclear program is only for peaceful purposes.